Rich to dark purple, 3-in. flowers have cream-colored eyes and contrast perfectly with the green foliage. When it blooms in the summer and fall, flowers cover the vine, thus earning it the name of "Wall of Flowers." 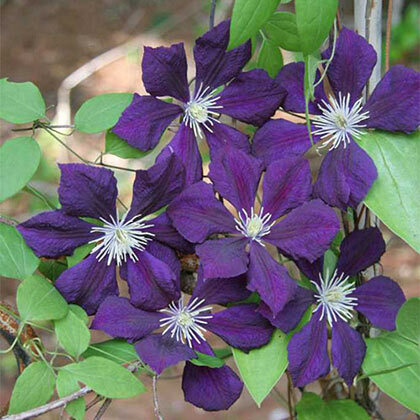 Clematis vines, like Etoile Violette, are excellent for covering walls and trellises, as a ground cover and for privacy screens. Grows 8-12 ft. tall. 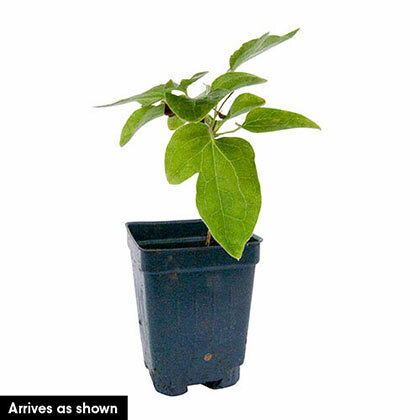 For best results, plant in rich, well-drained soil in full sunlight or partial shade. Clematis can be pruned after flowering or in early spring. Potted. Zones 3-8. Flower FormSingle, 3-inch, purple blooms. PruningAfter flowering, prune back hard to just above the second or third set of buds. CommentsConsidered one of the most free-flowering Clematis, its rich color adds excitement to the landscape. Cover a trellis, arbor, fence, or use it as a colorful groundcover. DepthDig a hole twice the size of the container. Place the plant at the same level it was growing at in the container.